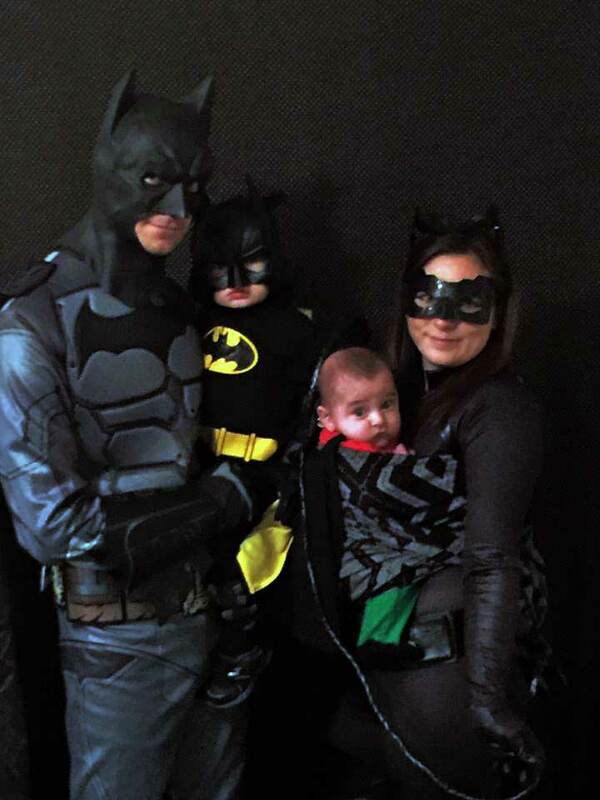 Creating a costume that plays off the baby carrier is one we babywearing parents cannot resist! 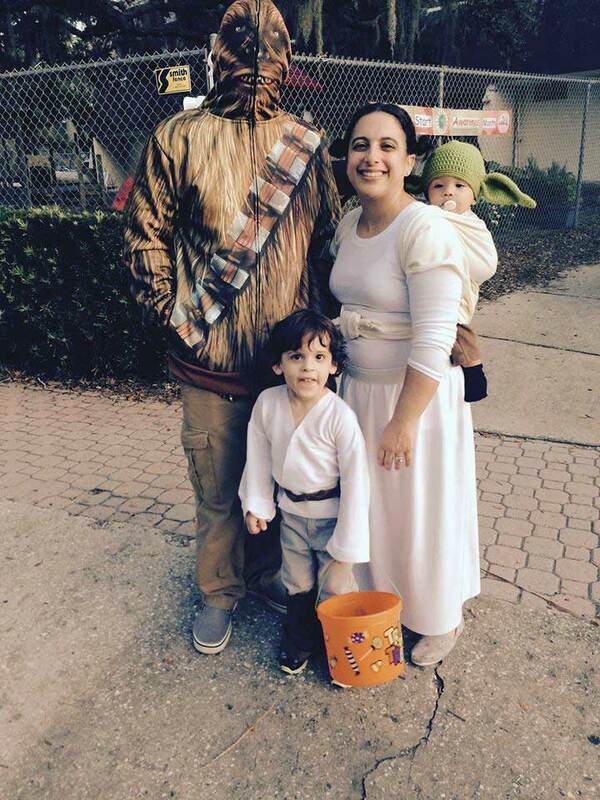 We get to show off our ingenuity and our babywearing skills; we get to reap all the benefits of keeping baby content and comfortable in the extra excitement of Halloween night; and now there is the added incentive of entering your babywearing costume in my contest to win a free woven wrap! 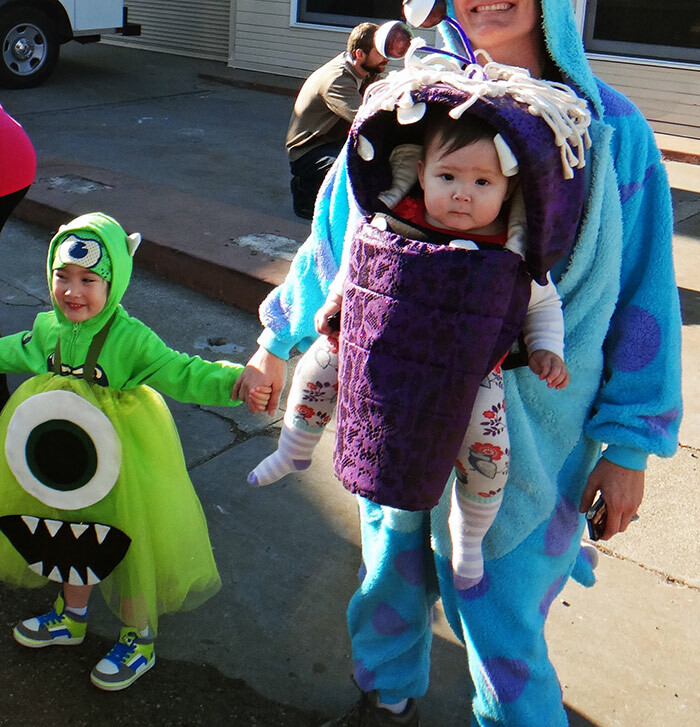 Over the years that I’ve been running this contest, I have amassed what I believe to be the greatest collection of babywearing costumes known to the internet. 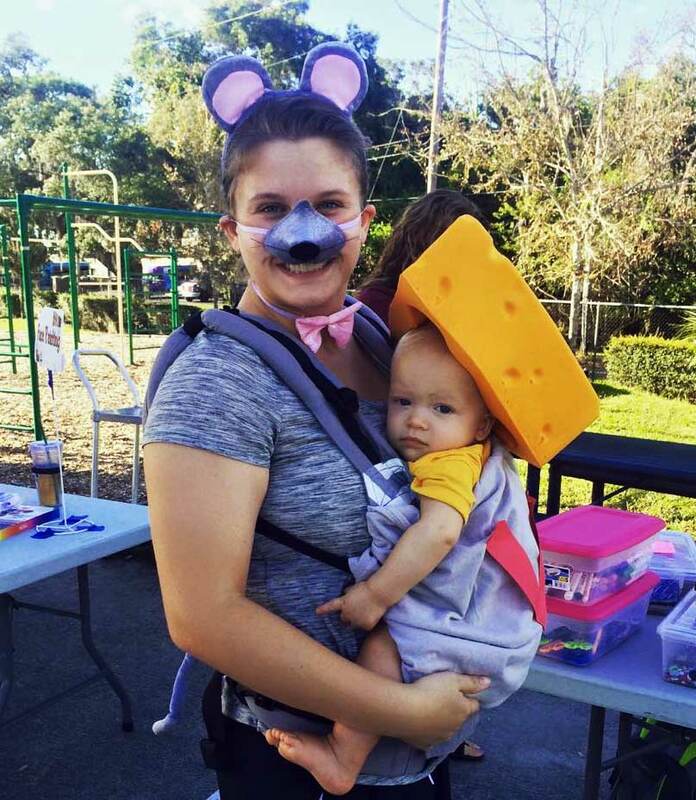 Your costume this year can be added to this Hall of Costume Fame, plus you might be the winner – and all you have to do is get a great picture of the creative genius you have channeled through your babywearing costume! Share your picture on the Wrap Your Baby Facebook page by 2 November 2017. Voting will be from 3-5 November and the winner will be announced on Monday, 6 November. And if it’s you, I’ll mail you a woven wrap prize right away! 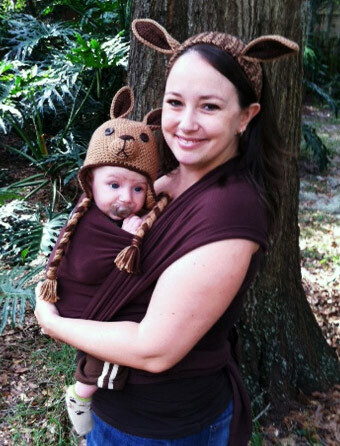 Sometimes it takes no more than a couple of cute hats to make the two of you into an adorable and endearing animal pair as with this mother kangaroo with joey tucked snugly in her pouch. What could be easier? Kangaroo is particularly easy since the baby carrier becomes the pouch. But if you had a wrap with a feather design, you might choose to get owl hats for you and baby. 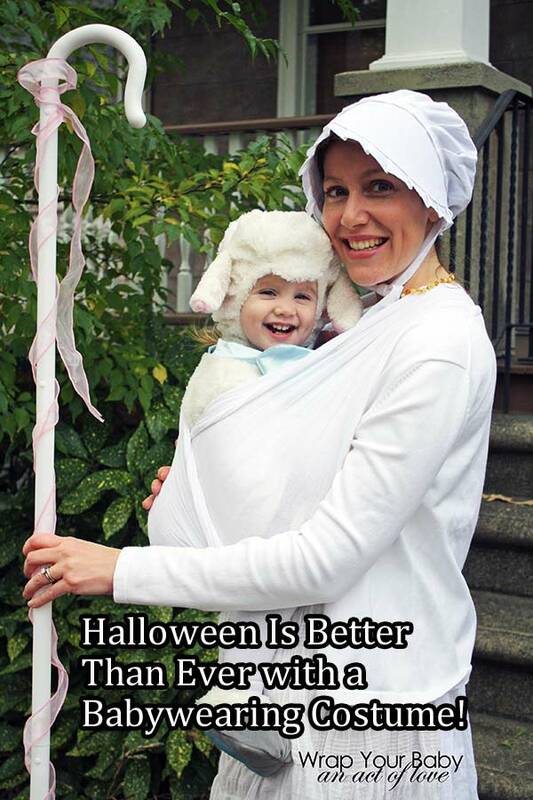 Or with a white, pink, brown, or gray carrier you could do bunny ears for both and pin a cute cotton tail on the wrap right at your baby bunny’s bottom. 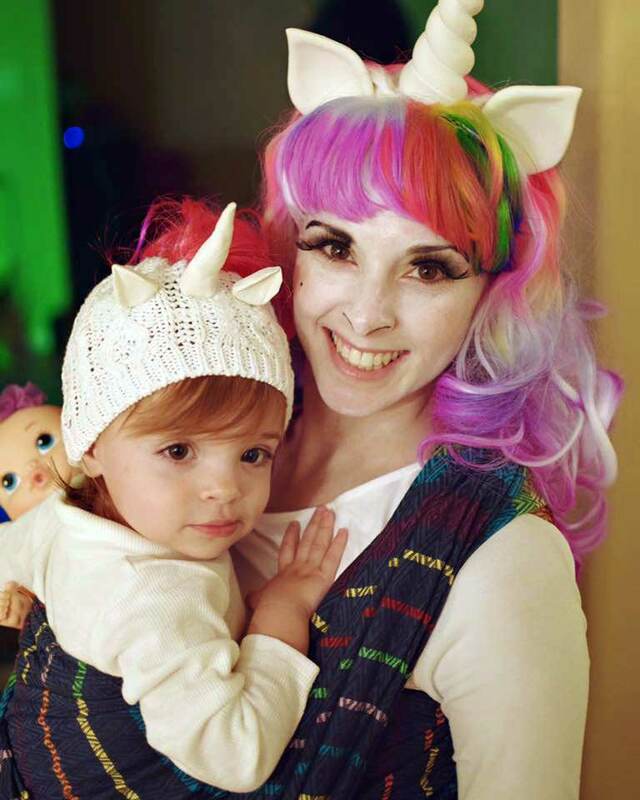 Mama and baby mythical creature also works here, as with this super fun babywearing unicorn costume. Colorful hair (wig or hair chalk or dye) and face paint optional. Animal costumes don’t have to be simple. You can get as detailed and intricate as you’d like. 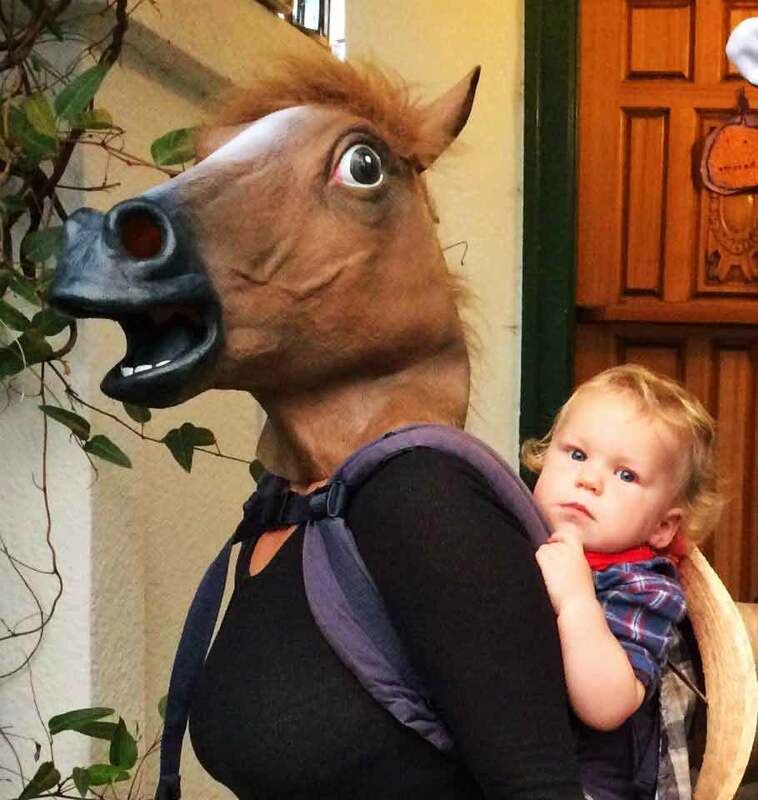 See a collection of animal babywearing costume ideas here. The Nostalgia costume brings back fond characters from the movies and stories of our youth, garnering some of the most emotional enjoyment for yourself and others of your generation who see your costume! 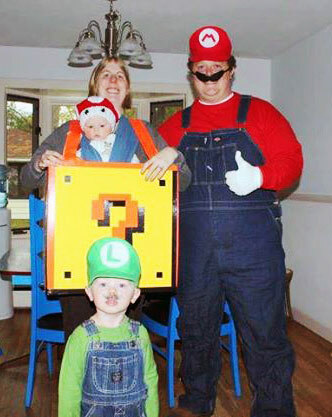 Love this one-up mushroom babywearing costume made so much better with the addition of Mario and Luigi. 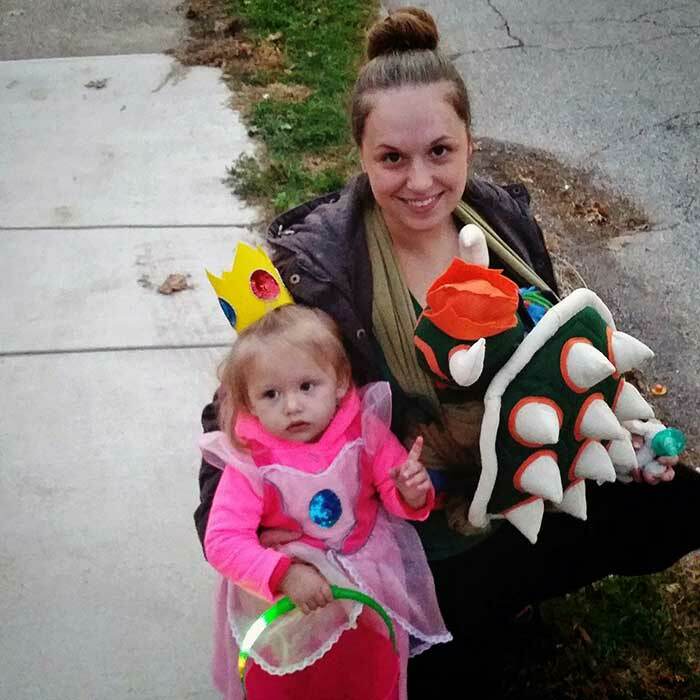 And what could be a more adorable babywearing costume than these siblings as Princess Peach and Bowser? And who didn’t want to be David Bowie??? 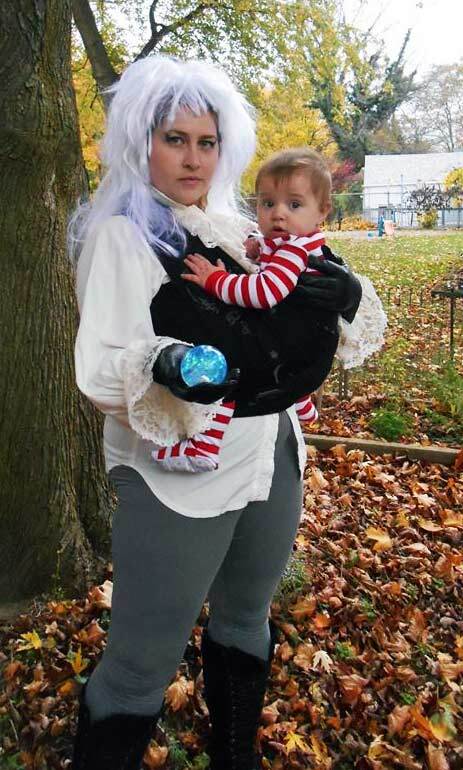 Here is the goblin king in the Labrynth with baby Toby. 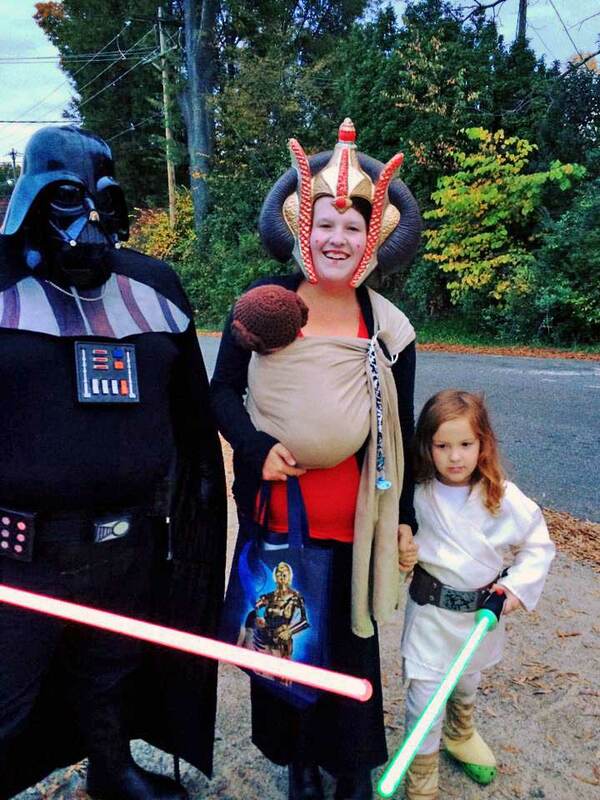 A cautionary tale for parents (careful what you wish for when you’re frustrated with the kids) and an amazing babywearing costume! 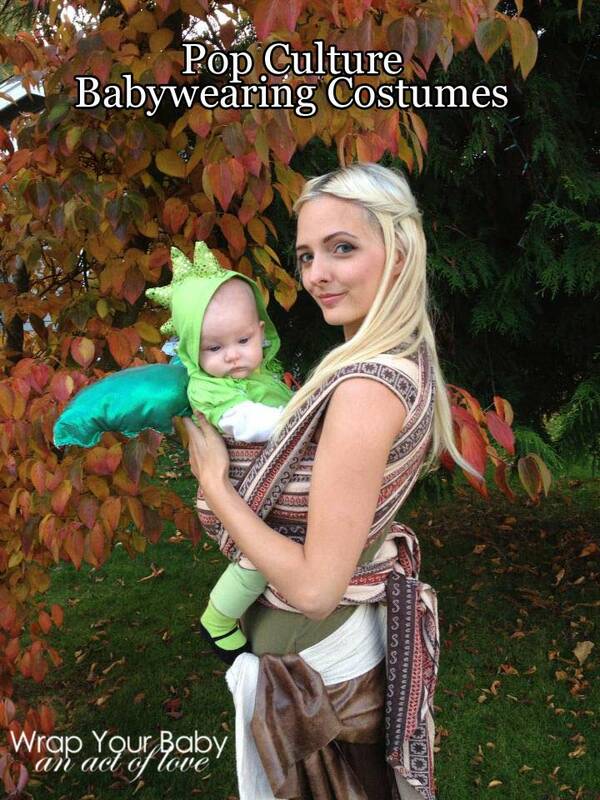 Get more Fantasy and Science Fiction babywearing costume ideas here. 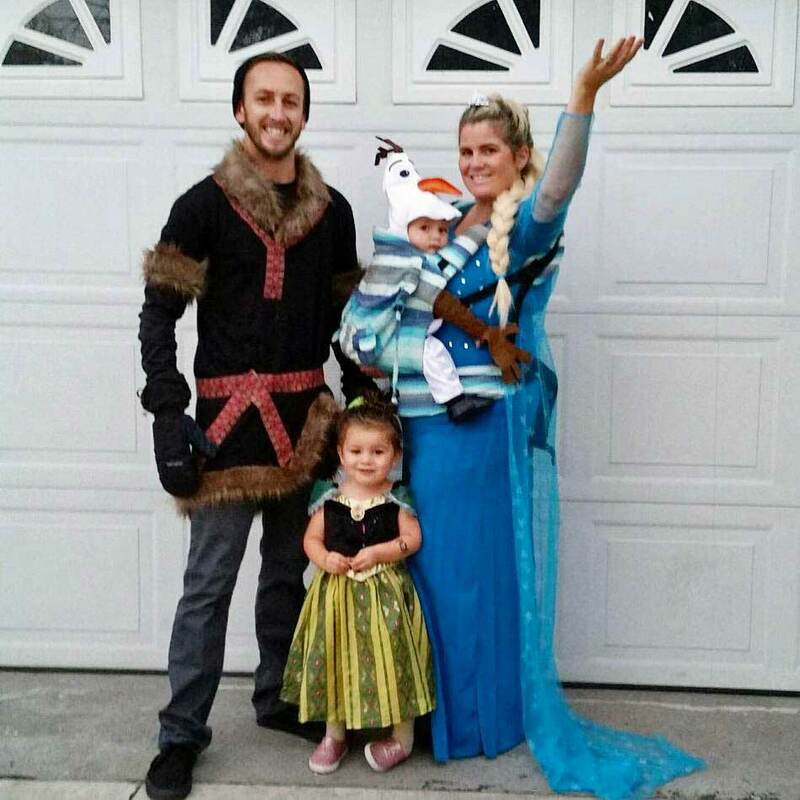 The whole family got adorably involved in this Elsa Babywearing Costume. 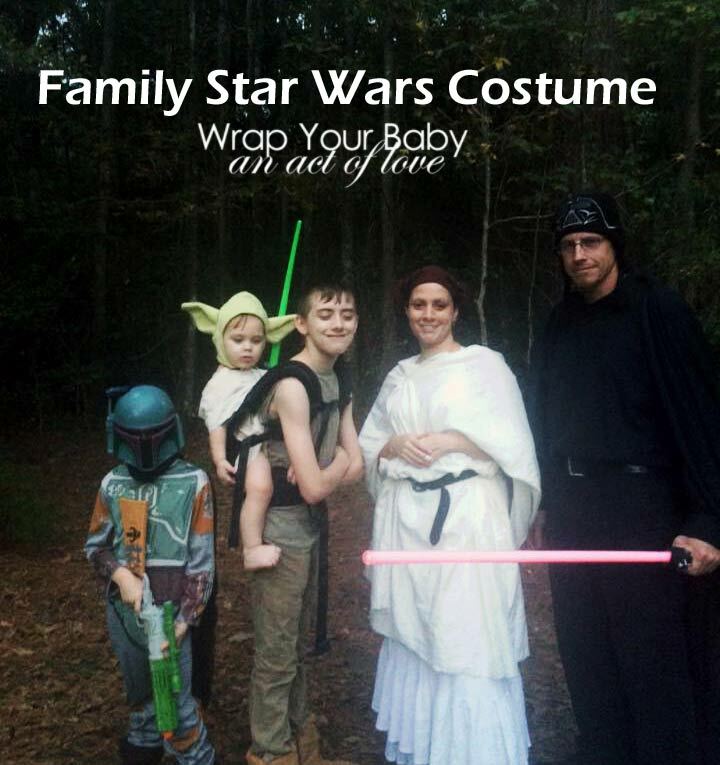 Dr Who is almost as popular a babywearing costume theme as Star Wars (see below) and there are so many ways to do it! 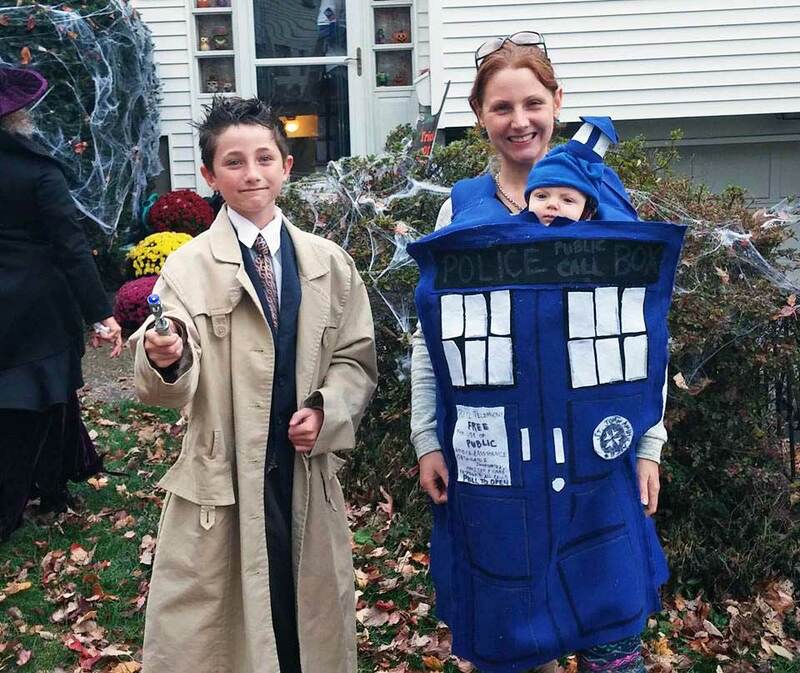 This family looks great with a young Doctor and mom and baby as the Tardis! 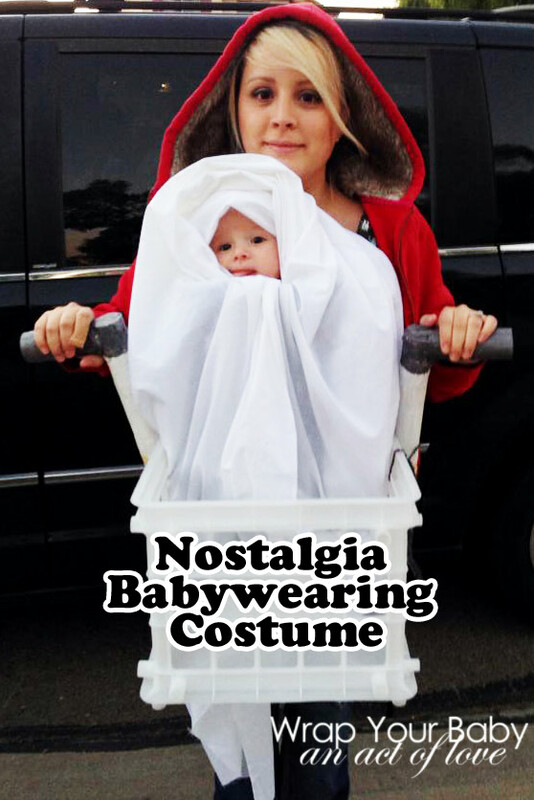 You can find lots more book, movie, and television Character Costume Ideas for Baby Carriers here. Just kidding – don’t do a cultural stereotype. There are too many brilliant ideas to consider something that may perpetuate hurtful stereotypes. 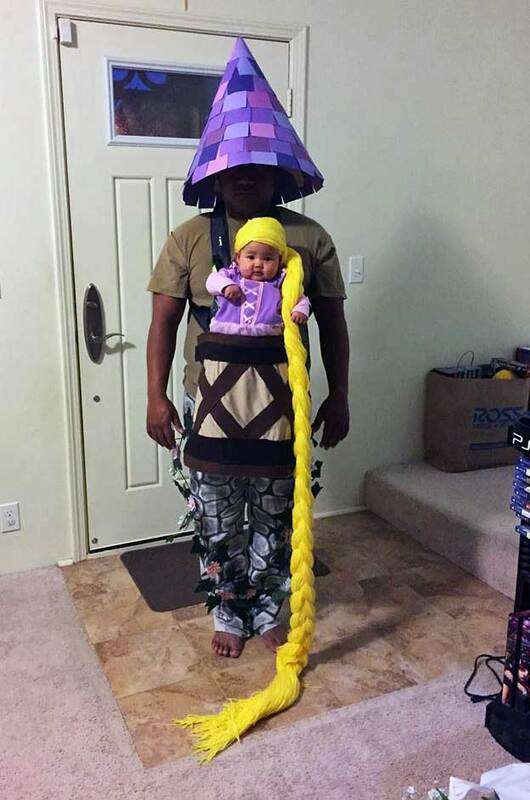 Sometimes a great costume is pretty simple. One horse head, one cowboy hat, and you have a horse and rider! Baby in a forward facing carrier dressed as a tiger is cute. 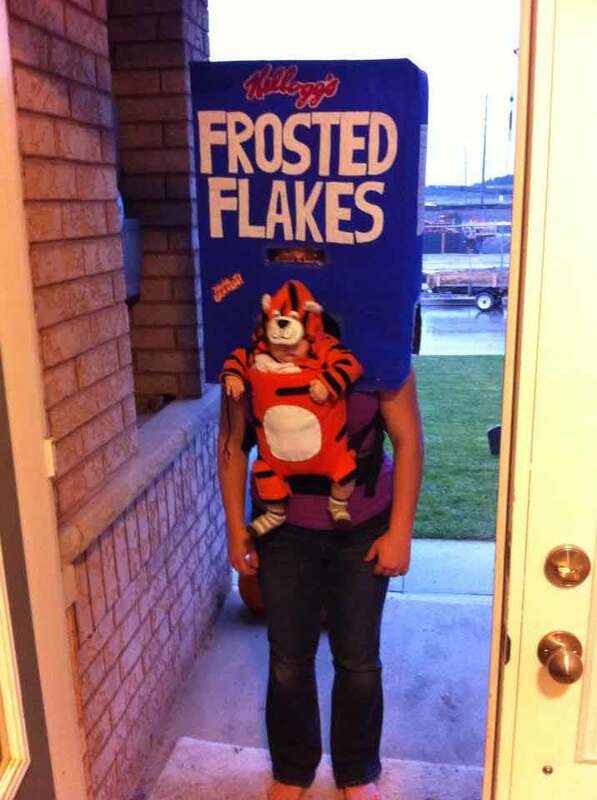 Add the Frosted Flakes box and your Tony the Tiger is an unforgettable costume that people will talk about for years! 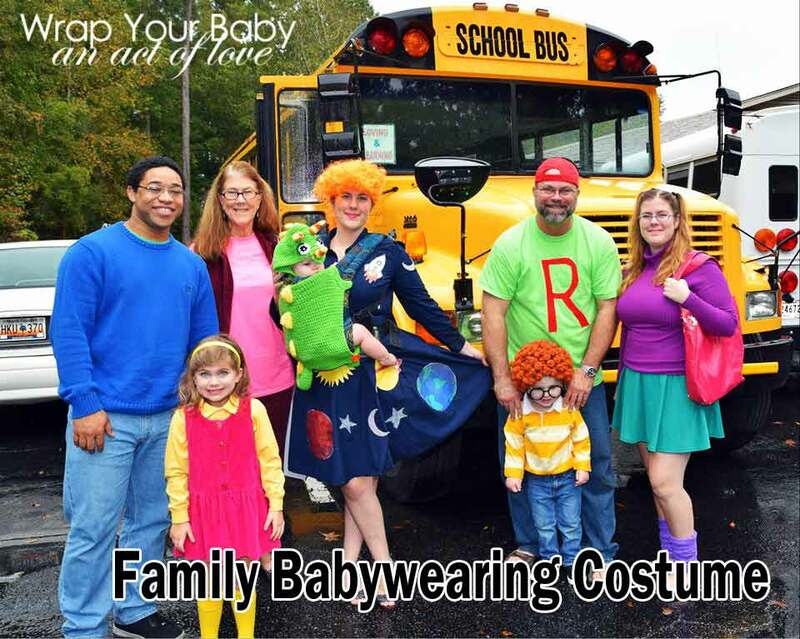 When you have a big family or fun loving friends, you can go all out with an ensemble cast costume such as Magic Schoolbus. Posing for a picture in front of a great prop like this school bus lifts this babywearing costume up to a whole new level. 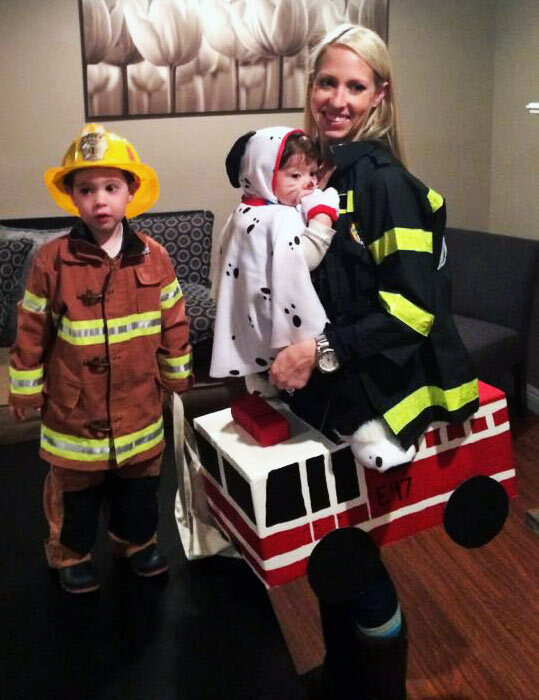 Firemen, firetruck, and baby dalmatian. 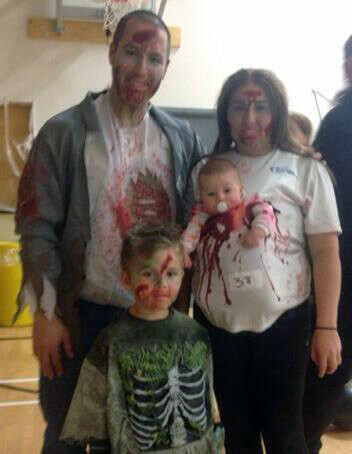 The sports fan family. 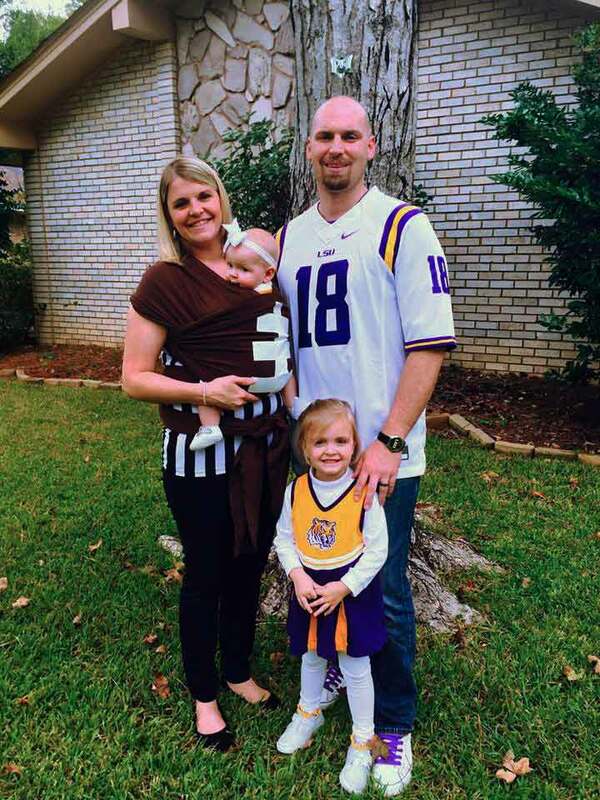 After all, babies are already football shaped. Adding white tape to a brown wrap is easy and a looks perfect. 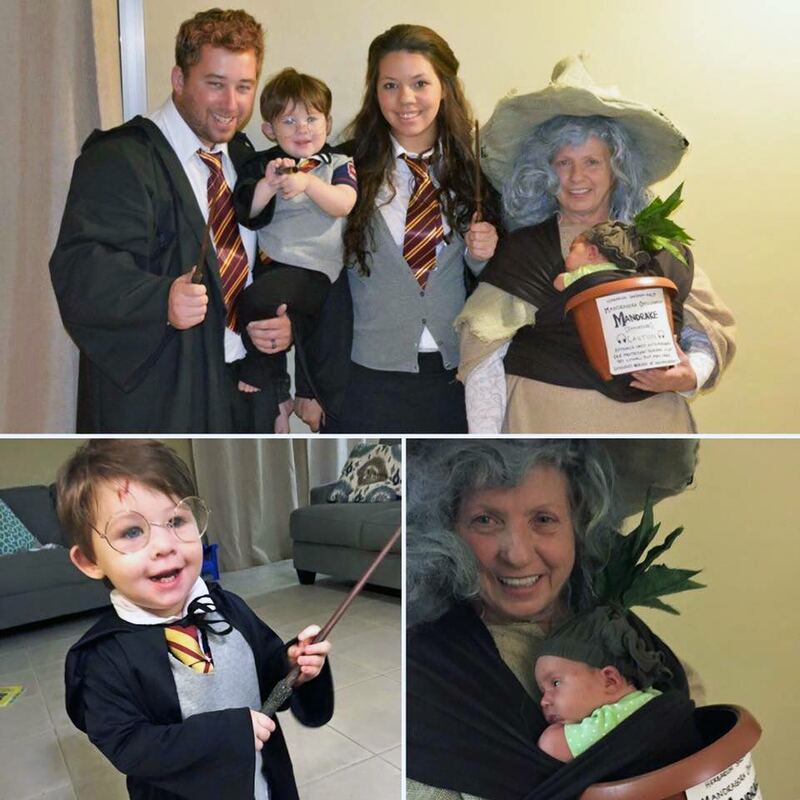 Harry, Ron and Hermione hanging with Proffessor Sprout and her baby mandrake makes a winning babywearing costume! 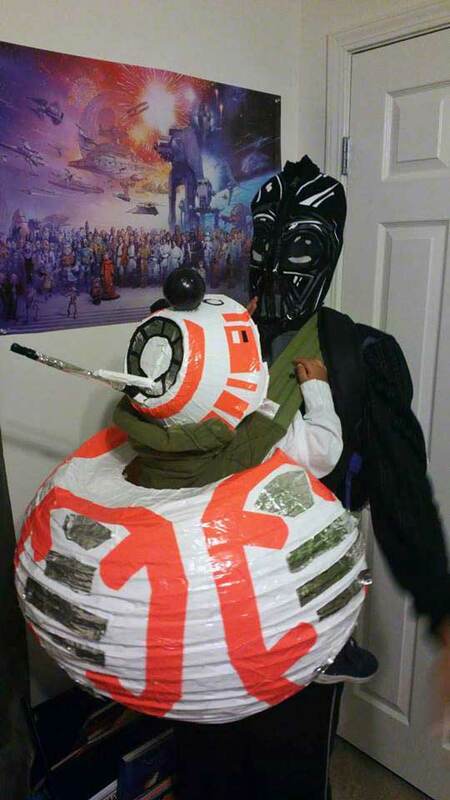 Parents of twins appreciate baby carriers more than any of us! 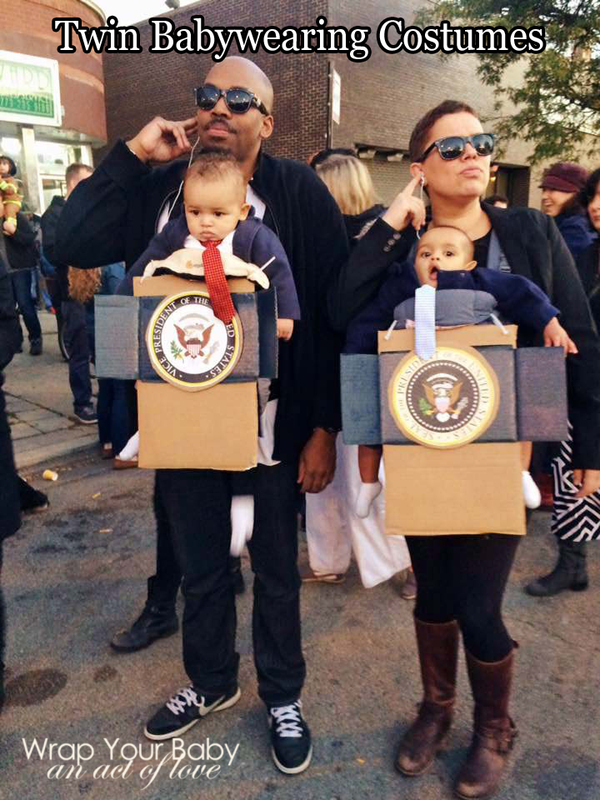 So of course they’re going to want to find a great costume for both of those babies. 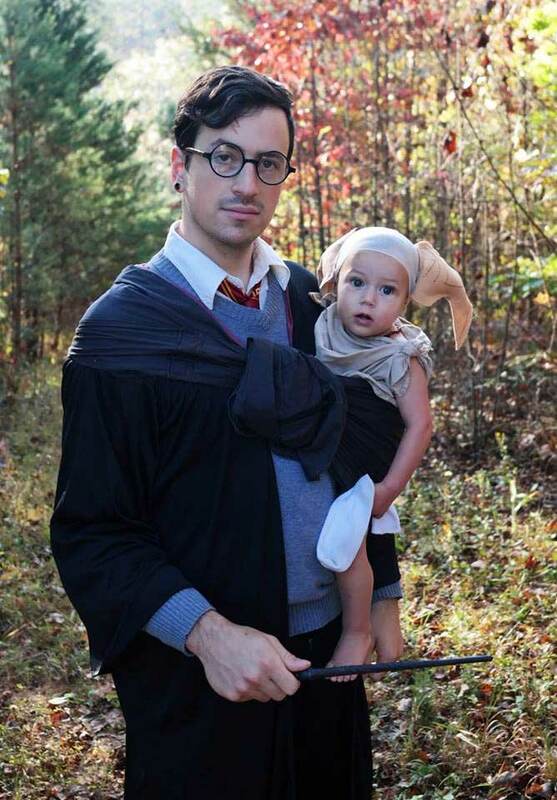 These twin babywearing costume ideas can also be done with siblings of different ages. 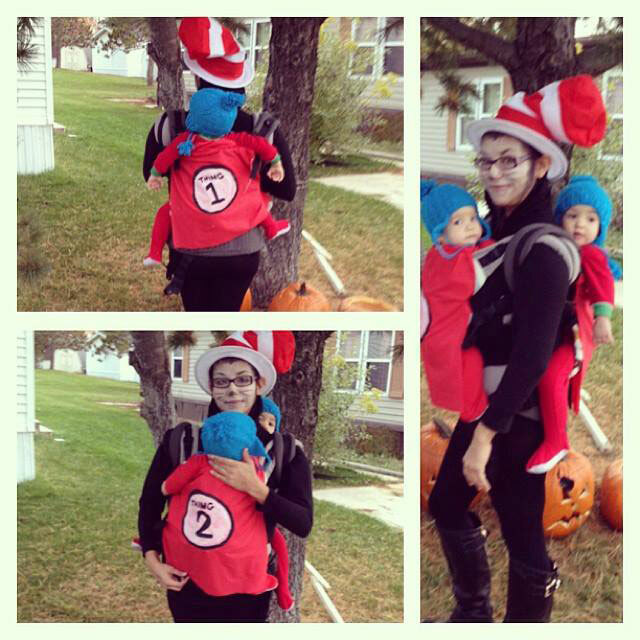 Every twin mom has a thing one and thing two so lets just get a tall striped hat and make it official: you are the Cat in the Hat for a tandem babywearing costume! 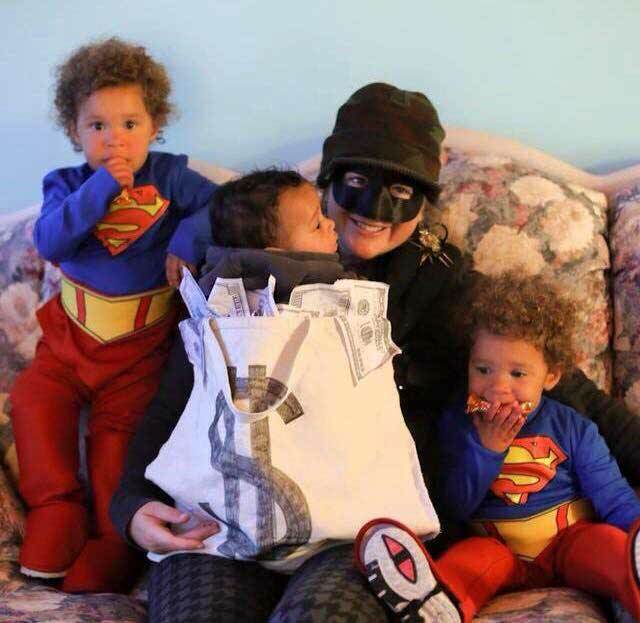 When twins aren’t the baby anymore, you get this inspired family costume with mom burglar, baby money bag, and twin super heroes to the rescue! 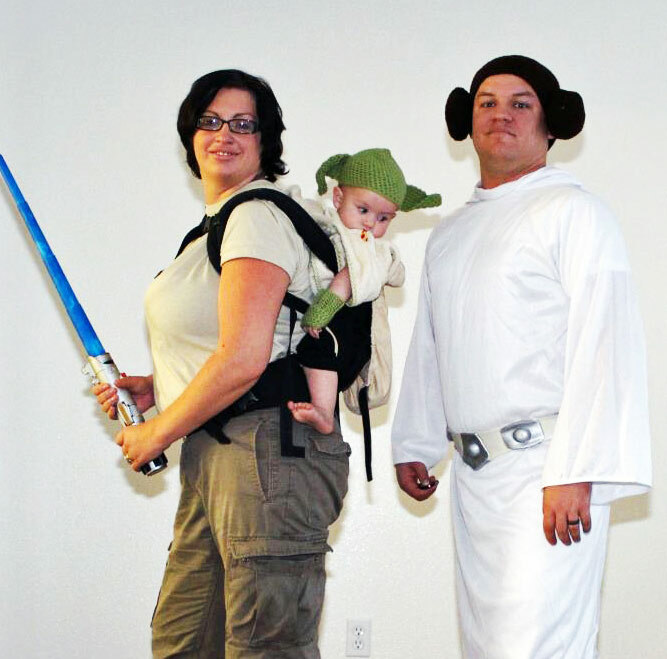 Need a tandem or twin babywearing costume for one on front and one on back? Oreo with you as the cream is the perfect way to go! 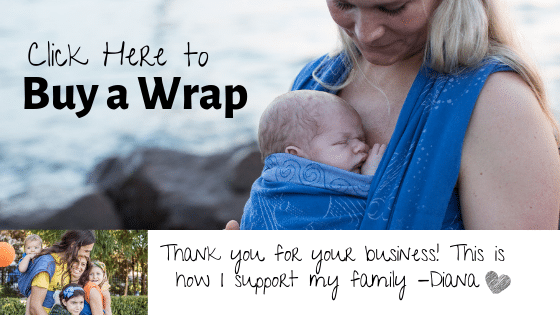 Information on how to wrap 2 babies or children on my Tandem Wrapping page. 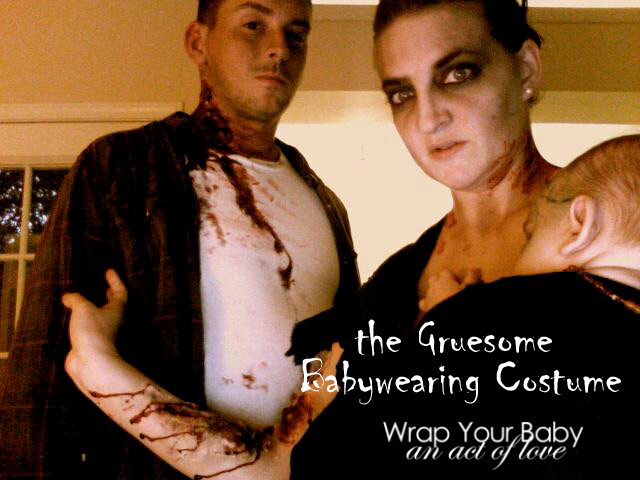 Makeup and a little fake blood go a long way toward the perfectly gruesome, creepy babywearing costume for horror fans! 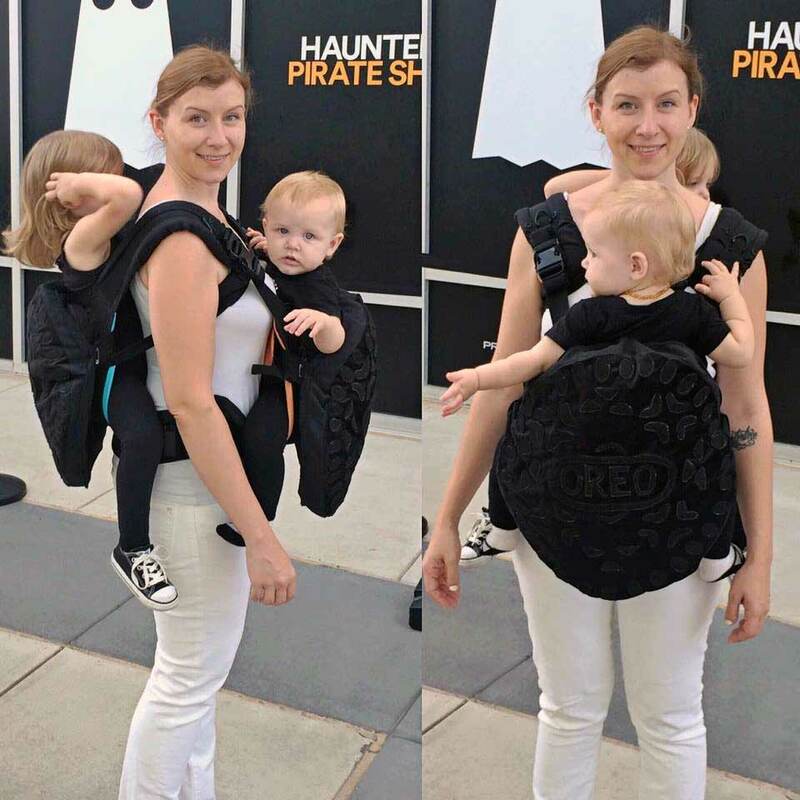 Baby breaking out through the chest is always an exciting look and perfect for a forward facing baby carrier! Shark and shark attack victim – very menacing, even in his sleep, don’t you think? 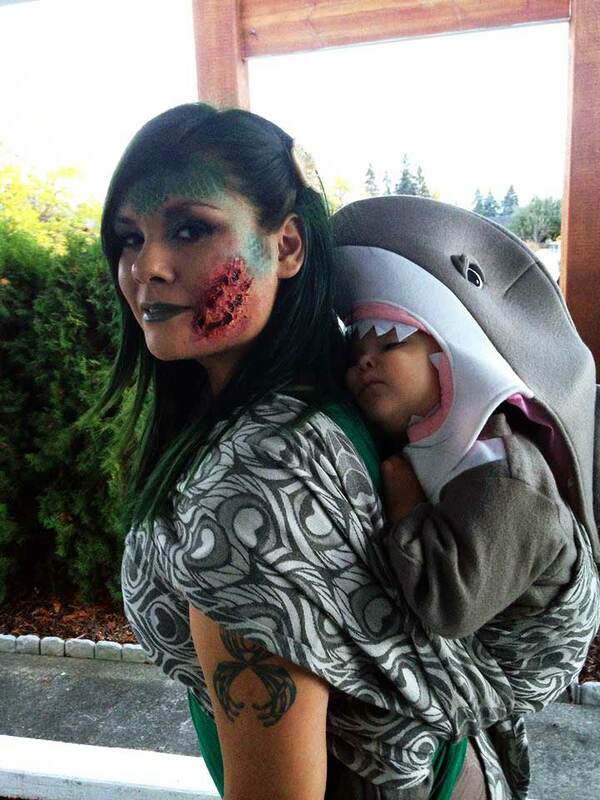 See more horror-themed babywearing costumes. 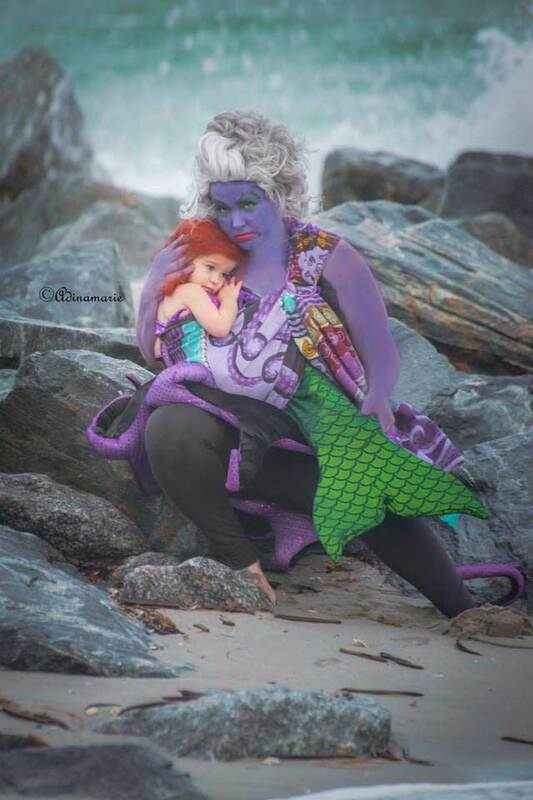 Ursula the Sea Witch has little Ariel all wrapped up in this Little Mermaid Babywearing Costume. 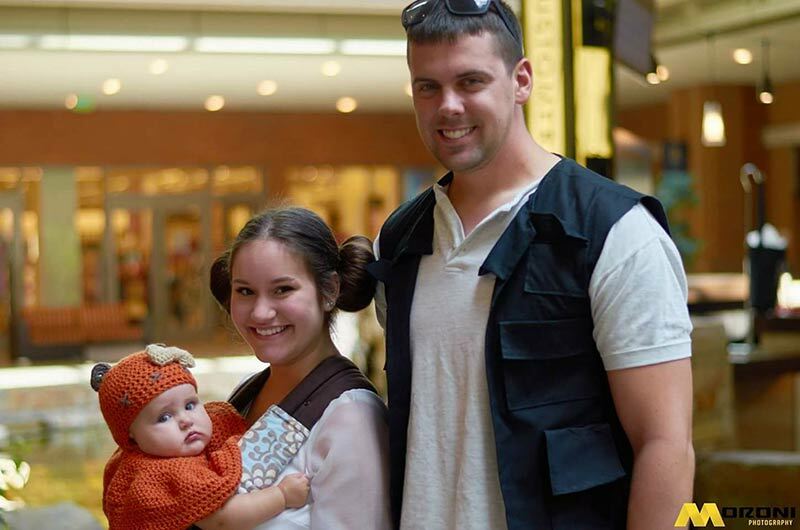 So many characters to choose from – there seem to be endless variations on the Star Wars Babywearing Costume. Here are some to get your creative juices flowing!